Author’s Ink Publications is an upcoming leading publishing house of India and enjoys the repute of being one of the fastest growing publishing houses with more than 150 titles already published in a time span of 3 years. We have titles that rule in the top 10 of the amazon, Flipkart etc’s books categories. Our focus is both creative and progressive. Author’s Ink Publications is known for its selfless work in giving new authors a platform to represent their worth and realize their dreams. In the competitive world, Author’s Ink Publications is giving it’s every bits and piece to establish new authors with all the support they want. All this is provided with a dedicated support team. Author’s Ink Publications publish books for almost all segments, which include Fiction, biography, travel, religion, poetry, history, business, health & fitness, lifestyle, and politics. Author’s Ink Publication helps to empower every budding writer who interacts with us since we believe that a sustainable growth is only possible if we associate with each sphere of the business we are into. Author’s Ink Publications is a blend of truthful publishing, trustworthy editing, and promotions all under one roof. Author’s Ink Publication is eminent in round the clock support before and after publication. Our testimonials and the group of authors mention it with proud. We at Author’s Ink promote highest transparency and support. We are the torchbearers in the online distribution of our titles available on almost all the leading e-bookstores like Paper Fox, Amazon, Flipkart, PayTM, etc. Not only the online selling is promoted, but a dedicated team named as “Paper Planes Book Marketing” looks after the distribution of books to the leading bookstores in every nook and corner of the country. A global marketing is usually promised but the book fails to reach the local bookshops. We assure to bridge the gap between authors and readers. Author’s Ink also is an esteemed partner of the “Trust Worthy Editing Works” which constitutes a team of learned and stupendous editors with great experiences to bring the manuscript alive. E-Books are also promoted with equal interest by the company on leading e-book stores like Amazon Kindle, Google Play, Kobo, Daily Hunt etc. The company promises its full cooperation and support to the author before the publishing and after the release with an on time royalty payments, truthful sales report and a 24-hour answerable team. The company’s portfolio covers a wide range of genres from fiction and non-fiction titles both in English and Hindi language. Author’s Ink Publications is also the publisher of India’s smallest Love story book that has created records in leading record keepers in India. Come join the Author’s Ink Family to experience a hassle-free publishing. Always feel free in contacting us in case you are an innovative, budding and creative writer. Aniket Kapoor was born and brought up in Rohtak in a family which was and is closely linked to education and teaching. His upbringing and education triggered a deep respect for creativity and talent. To support the talent of young authors, he founded Authors’ Ink publications. The Author’s Ink was his own venture which got support from his family. It is in the early twenties when youth usually start to plan their career. 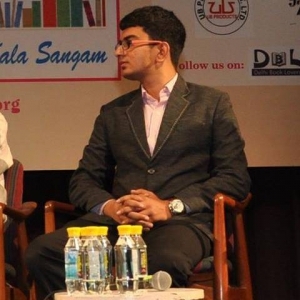 Aniket planned to be an entrepreneur and started this publication house with a determination to give vent to young writers and founded the Author’s Ink Publications in January 2014 . The motive behind Author’s Ink was sole to help new authors to publish their work with selfless support and service. He is pursuing MBA from Maharishi Dayanand University. Being a student himself, he understands what the young writers need and give them equal opportunities to express their ideas. Starting with 2-3 titles, presently more than 40 titles are published under Author’s Ink within a year with some of the titles ruling the top 10 in various charts. All the titles have been deeply studied and supported by Aniket himself and 24*7 availability is assured to everyone by the team of Author’s Ink. Today, when Author’s Ink is determined to be the leading publishing house of the country, Aniket, for the youth is a role model of determination and courage. His hard work is deeply acknowledged and praised at various levels. He has been a part of various literature fests around the country. Author’s Ink is promoted in each fest making thousands of new fans each time. He was also a part of the discussion panel of Delhi Literature Festival 2015 discussing on the upcoming publishing houses.